I have for sale two baby night lights, these are new never used without box or instructions, was used as display. 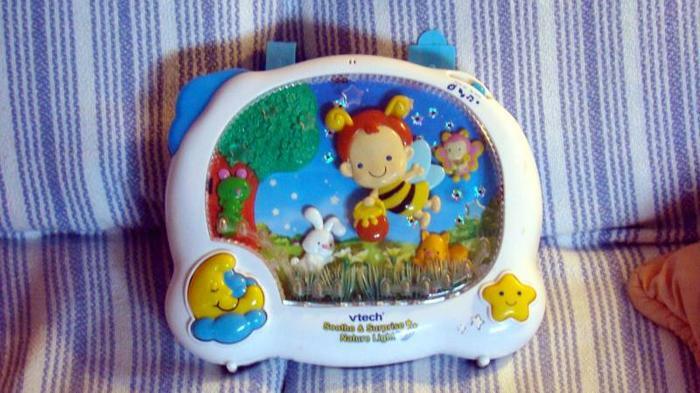 #2 Vtech Baby Bear Sweet Dreams musical projector is in great condition. The baby Bear Sweet Dreams is an advanced cot light that projects relaxing patterns onto the ceiling along with 3D images to not only soothe and relax, but also develop your baby's tracking and focusing skills. With a range of classical and natural sounds, your baby will be soothed gently off to sleep in a delightful way. Sound sensor activates if baby cries, playing music and making the sweet dreams bear on the moon light up and rock back and forth to calm and lull baby back to sleep.